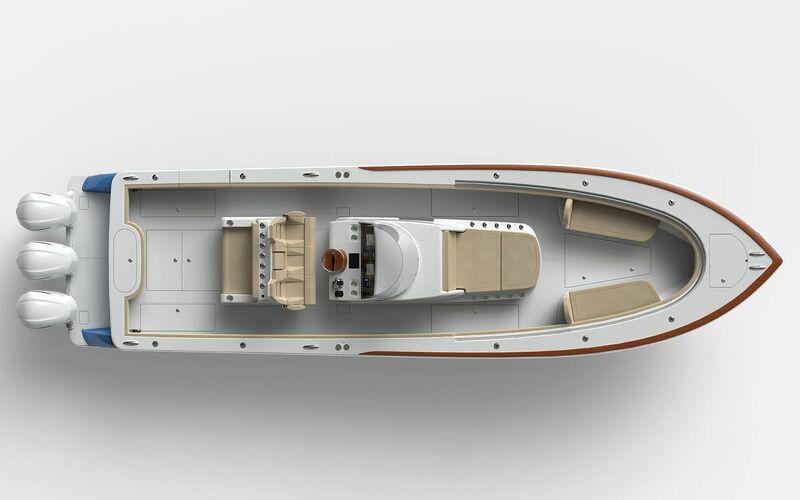 The new Valhalla Boatworks V-37 is the middle child in the new line-up from the legendary Viking Yacht Compmany. This outboard-powered deep-v center-console will debut as the best in its class thanks to the patented stepped hull design which improves both performance and maneuverability. Owners will have multiple options when it comes to outboard power, being able to choose horsepower from 300hp and up along with multiple configurations. Viking's resources like Palm Beach Towers and AME electronics will also play a large part in outfitting the V-37, ensuring that Viking's quality control remains the industry standard no matter what model is being built. While not many details on the new Valhalla V-37 are available, we will be bringing you the latest photography and details as they become available. Length Overall 36' 7 3/4"